At first glance playing the game can seem quite complicated so this page will outline most of the steps that you go through when you play the game. Before you do anything, you need to register with the site. You should provide your LAN username as it is listed on the seating plan or attendance list for the event you are attending. This is important as our automated attendance checker needs ensure you are going to be at the lan hosting the game you signed up for. You should also make sure you have paid for the event in question, and chosen a seat on the seat picker. At least a head and torso shot. Full body is preferable but will require a higher resolution image. All uploaded photos will need to be validated by an admin (WK or Cabe) before they are accepted. So there's no point uploading random images. Once you have your validated profile image, you need to sign up for a game at an event. 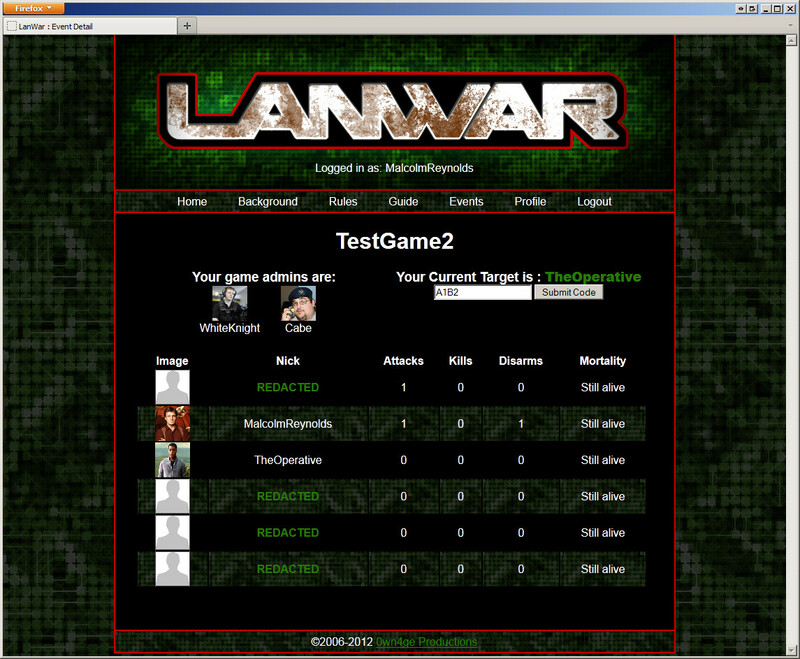 To do this visit the lanwar events page. On this page you will see a list of currently active games, upcoming games, and past games. Any games that you are able to signup for will have a signup link next to them. If you click this link your seat will be checked and then you will be added to the player list. Once you are signed up, there's nothing more to do until you get to the lan. As soon as you arrive at the lan (and have settled in) come and find one of your game admins. At the i-Series this will likely be WK or Cabe; however, there may be others so it's worth checking the event info page, or the thread on the fourm. You should bring with you your event badge, and your game fee (currently £3). Your game admin will check your identity, take your fee, and provide you with your first dossier, and your sticker pack. Your sticker pack will contain your life token, your 4 weapons, and depending on the setup may also contain some "taunt" stickers for the luls. Check the Lanwar events page to confirm the exact start time of the game. I-series games will start at 9am on the Saturday. Between now and then, you can take the opportunity to scout your target, get the lay of the LAN, etc. This makes it advantageous to be early picking up your dossiers as you can get more "prep" time. Once the game goes live your paranoia can kick in to high gear. Please be aware: Anyone who hasn't paid, and collected their dossier (or given an adequate reason why not) by the time the game starts will be automatically killed off. Once the game goes live you will be able to view the game progress from the link on the Events page. On the event screen you will see a list of all players in the game, but only you, and your target will have details. All other users will have their info hidden to stop people pre-empting their attacks or knowing who their assassin is. As you can see, we track attacks, kills, and disarms. These statistics are used at the end of the game to calculate the winner. Dead players will be shown in red. So, you know who your target is, you have scouted out their PC at the lan, identified what they actually look like and you are ready for your first strike. Let's assume you are going with the Bomb first, as this is simple. Wait for them to leave their desk, then sneak in. Find something they will use on their return, for example their chair. Attach the bomb sticker to the item, ideally somewhere not obvious, and then stand back and wait. When they return to their machine, as soon as they sit on the chair they have triggered the bomb. You can now wander over and claim your victory. Once you have made your target aware that they are dead, they must hand over their current target dossier, and their sticker pack including their life token. At this point you have two choices. 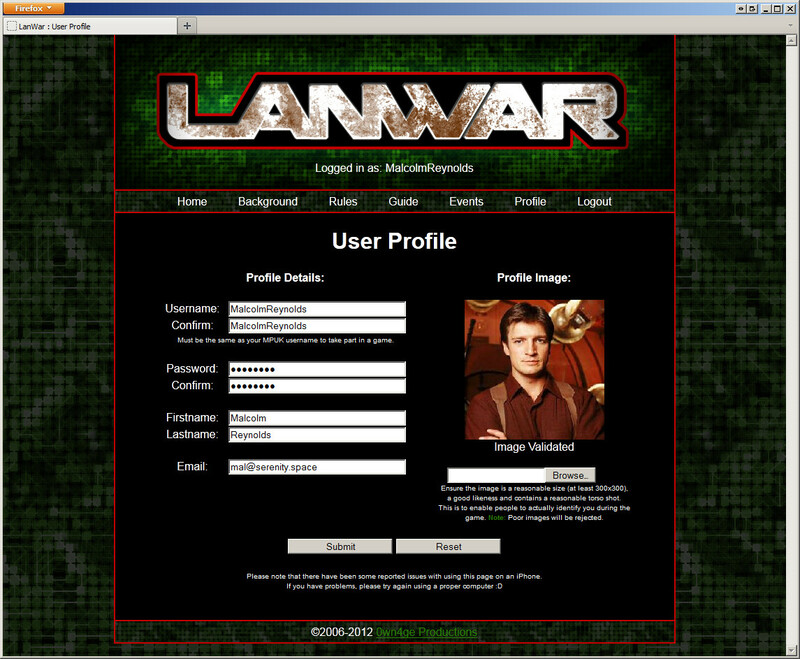 You can either whip out your QR code reader on your mobile phone, or you log in to the LanWar site as normal. If you log in to the normal site, visit the game progress page, and enter the code for the weapon that you used in the box at the top of the page. This will register the actual kill. You then need to enter the code for your target's life token. This will then transfer all of your target's weapons to you so that you can use them to kill people and score points yourself. If you opt for the mobile option you just need to scan the two codes with a QR code reader app. 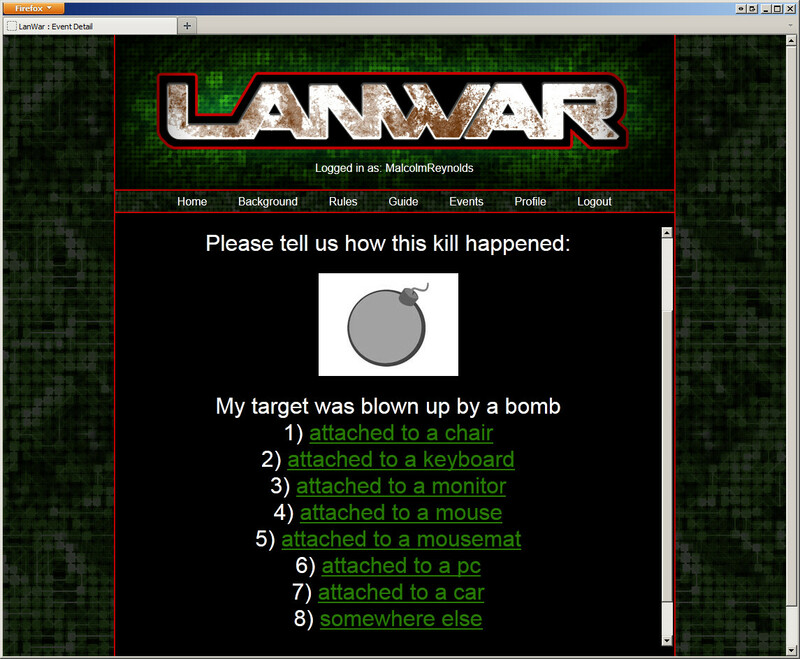 First scan the weapon (so in this case, the bomb sticker on the bottom of your target's chair) then the life token. For completeness it is usually sensible to sitck your targets life token to the dossier with their name on it. If you don't record both parts of the kill, then you wont receive any points for it, and the site won't track the game progress properly or allow you to progress further in the game, so please ensure that this is completed before moving on to your next target. When you record the weapon use you will be prompted to enter how they were killed. This is enables us to track how the game happened, and to see trends for future games. Obviously it's not this simple in reality. Your target will be aware that their desk has been unattended, and should check to make sure no bombs, or poison have been planted before using anything. If they discover a bomb or poison before using the item in question, this is a disarm. If they do disarm your attack you should now sneak away and keep your identity secret ready for your next attack. Once a weapon has been disarmed it should be immediately registered on the website. You will gain points for doing this, so make sure you do. You do this in the same way as you record a kill. Either by scanning the QR code, or by entering the code on the event page. The bomb and poison are passive weapons. That is to say you don't need to be in direct contact with your target to engage them. The gun and the knife, on the other hand, are a bit more interesting. An example gun attack might go as follows. You identify your target and follow them, discretely, to somewhere like the stage. While their attention is elsewhere you strike by placing the gun sticker on their shoulder. You can now claim the hit, and start the process of confirming the kill via a game of "Rock, Paper, Scissors". Whoever gets the best of three comes out the winner. If you win, you claim the kill, and you receive their sticker pack, and dossier. If your target wins, they claim a diffuse/disarm, and you will have to go away and try again with another weapon. The obvious downside is that they now know who to look out for next time you want to sneak up on them. The same situation applies with the knife, with the exception that the game of RPS is a single round. So that's it. 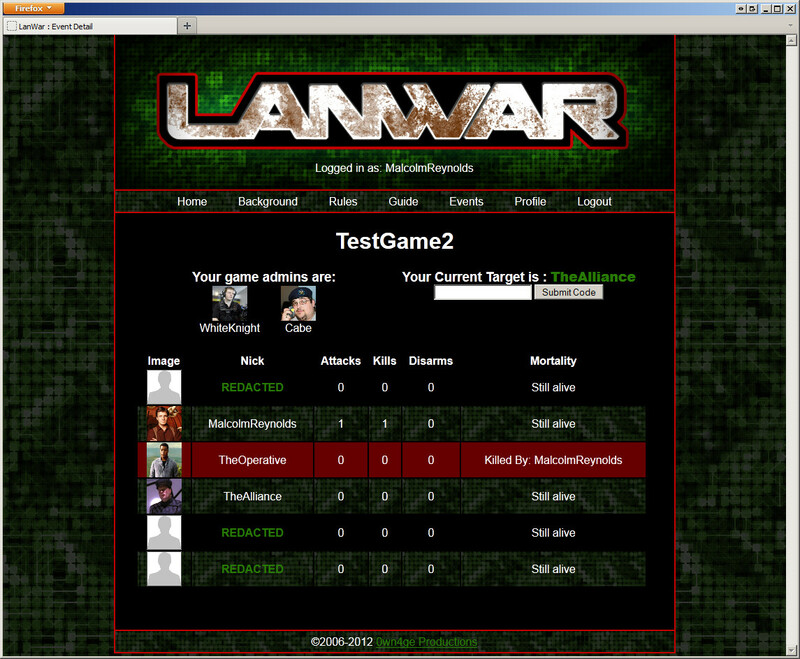 Once you have made your first kill, the game page on the website will reflect it, and update showing you your next target. Repeat the process until either you or everyone else is dead. So what are you waiting for, go sign up !